Digital signs announce your business to people passing by, and they are extremely effective at their job. In fact, in a survey of over 400 drivers in a metro area, 83% recalled seeing a digital billboard, and 65% reported seeing two digital billboards. Even more importantly, these respondents recalled the message on the sign or the brand doing the advertising. Digital signage is more powerful than ever, and the right sign has the potential to revolutionize both the inside and outside of a business. Some industries are reaping exceptional benefits from these signs. Take a look at the exciting ways key industries are using digital signage. In the above survey, when respondents were asked if they remembered digital signs in the area, the highest number of respondents recalled seeing a sign from a local radio station, a TV station came close behind, and in fact, another TV station took the fifth-place spot. Outside of these businesses, digital signs advertise the station, remind people to tune in, and display information about upcoming shows and broadcasts. However, many media companies also use digital signage inside. They use digital signs to display graphics and video content from weather reports to voting maps to charts and graphs and more. Digital signage allows TV stations to create video walls that don't have any limitations on configuring content. They can easily display graphics, text, and videos, and they can port in info from social media feeds or a variety of other sources. Restaurants use digital menu boards so they can display more information. For instance, some companies have the prices for different sizes of items rotate on the screen. Others use this technology so they can easily enter changes to their menu, share nutritional information with their customers, take down specials when they are no longer available, or switch between breakfast and lunch menus. The convenience of this technology saves restaurant owners money on printing menus, while also simplifying updates and making it easier to share relevant information with their diners. With the rise of online shopping, brick-and-mortar stores have taken a hit, and retailers have to fight harder than ever to get people to come into their shops. High-quality business signs helping these companies renew interest in their offerings. Outside, they use digital signs to promote special deals or events. They can even schedule messages in advance or set up the sign so that it displays different messages throughout the day. When people see these signs, they are more likely to come into the store. Inside stores, digital signage helps to create a more interactive experience for shoppers. Retailers use signs to advertise products, and they let their employees update the screens to reflect current trends or to better appeal to the shoppers in the store. Brick-and-mortar banks also have to compete with online banks, and digital signage can help them get the edge they need. When prospective customers see digital signs, they are more likely to enter the branch to ask for more information, and that's key because the majority of new accounts are opened in the branch. The right sign also makes financial institutions appear more contemporary and tech savvy. Traditionally, a lot of banks had signs with the time and temperature, and most quality digital signs still offer that feature. But many financial institutions are going further and sharing stock updates, bank advertisements, investment tips, and more on their signs. Healthcare facilities are using digital signage inside to help their clients relax in the waiting room. On a psychological level, most people deal with an explained wait more effectively than an unexplained wait. To soothe their patients, some healthcare clinics and hospital emergency rooms are using half of a digital sign for a queue management system and the other half for patient entertainment or health tips. Beyond that, healthcare clinics and hospitals use digital signage to enhance conference calls and board meetings, to facilitate employee training, and to improve communication and collaboration in a variety of ways. They can even use digital signs to consult with physicians in remote locations. Schools use digital signage outdoors to draw in new students and to lend prestige to their institutions. They also use digital signage to simplify scorekeeping, advertise their sponsors, and enhance sporting events with live feed videos. Educators use school signs to enhance their lectures or make learning more interactive, and the right sign can be a great source of infotainment for the whole school. When schools have a variety of signs, administrators can push different messages to different signs. For instance, signs in the teacher's lounge may carry messages earmarked for teachers, while outdoor signs may have special messages for parents or passersby. All kinds of entertainment venues use digital signage to promote events. Sometimes, they share video feed from the event so that people in the venue can get a better view, but they also incorporate signage that's visible to people standing in lines or walking by outside the venue. Movie theaters use signs to let people know what films are playing, but they also use them to broadcast trailers of upcoming attractions. Theme parks can showcase new rides or even broadcast films taken by people on the rides. Military signs are used in recruiting efforts, and military colleges and academies are also using digital signs to create interactive experiences at sporting events. At some games, branding partners have set up sharing stations where attendees can capture pictures of themselves against green screens, add fun backgrounds, and upload to social media. Other screens let fans turn themselves into Army-Navy bobbleheads, and the images stream onto a social media wall in real time. Digital signs integrated with motion-detecting cameras were able to capture users kicks, and grade their velocity, speed, accuracy, and distance. These interactive displays offer a lot of fun for game attendees, but even more importantly, they act as data-gathering marketing tools. As users engage with the signs, military schools and their branding partners get their social media profiles as well as relevant demographic details. Municipal signs welcome visitors, promote special events, and share messages with the community. But some cities are going a step further and using digital signs to create smart cities. Using a combination of network technology and LED signage, these communities provide weather updates, traffic alerts, and other timely information, but they can also promote companies in the area or share messages from the tourism board or local chamber of commerce. Outside their buildings, many churches are using signage to share updates about service times, special events, and fundraisers, but as evidenced by the number of church signs that have gone viral, churches are also using signs to post creative, insightful, and often funny messages. 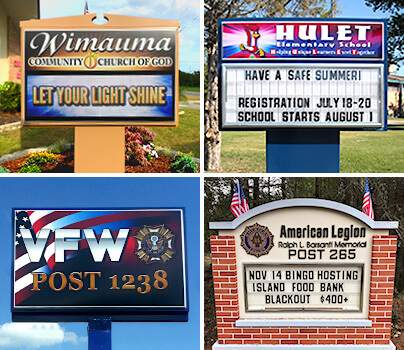 As they attempt to gather new members into the fold, quality outdoor signage is essential, and many churches report having almost instant boosts in attendance after putting up a digital church sign. But outdoor LED signs are just the beginning. Religious organizations use indoor digital signage to boost visibility of the service in megachurches. In many cases, digital signs are replacing traditional AV equipment and becoming the go-to option to share videos and pictures from mission trips or other activities. They can also share members' accomplishments, create interactive theology messages for children and Bible study attendees, and serve as flexible announcement boards that can be updated in real time. Regardless of which industry you are in, a digital sign can improve communication with your clients and help you get noticed by new prospective customers. At Stewart Signs, we create custom digital signage for our schools, churches, and businesses. To learn more or to get a quote, contact us today.